It’s been a long road for FromSoftware from their very marginal days as a developer working on titles like Armored Core and King’s Field for the PlayStation to their cult critical acclaim with Demon’s Souls, and breaking into the mainstream with Dark Souls and Bloodborne. And although Sekiro is very different than their previous titles, all of that DNA is still very much here. 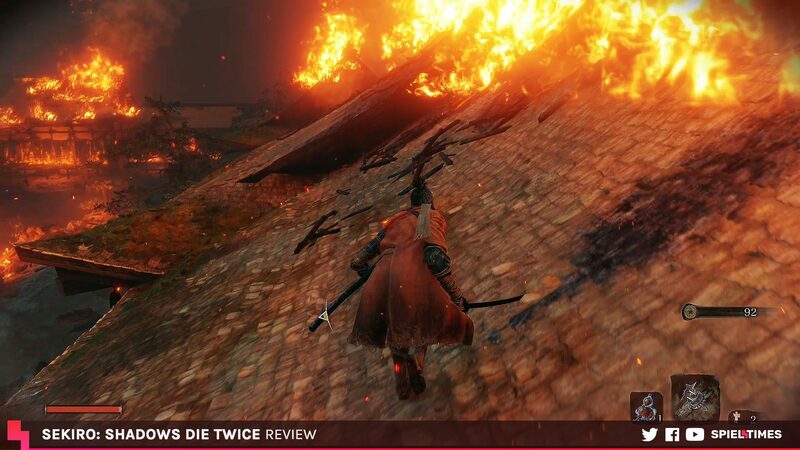 Take to the roofs in Sekiro: Shadows Die Twice to avoid being detected by enemies. Souls series and Bloodborne director Hidetaka Miyazaki returns to direct Sekiro, and many of the Souls series trademarks are here. In those games, you had bonfires or lanterns. In Sekiro, they’re prayer idols. Where you once had estus flasks or blood vials, you now have the healing gourd. Where you once had souls or blood echoes, you now have sen, and so on. But there’s also a lot about Sekiro that’s different: it’s not an RPG in the sense of those games. You play as a set character, the Shinobi known as Wolf, and there’s no character creation here. You don’t get to experiment with different builds and classes either. While you can progress your strength and increase your health by killing bosses, you can’t simply grind your character stats up with the game’s currency, sen, as you could in those other games. This means Sekiro is a more skill-based experience. At most, you can earn extra skill points to unlock a new move in combat or a latent skill that might improve your ability to parry enemy blows a bit, but these abilities aren’t going to let you just brute force your way past the game’s many excellent boss encounters. You will have to learn. Learn their design, learn their move-set, and learn to parry. 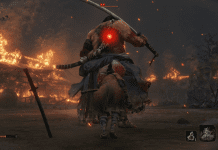 These are the fundamentals of Sekiro’s brutally difficult combat. It’s much faster and more aggressive than any of their previous titles. The key here is something called the posture meter. Your opponent’s posture bar occupies the top of the screen while Wolf’s is at the bottom. When you parry an enemy’s blow or land a hit, you damage their posture, and equally, your posture drains when the enemy parries your attacks. Rather than whittle away at enemy health bars, it’s better to parry and counter to take down their posture. When an enemy’s posture breaks, they become stunned for a crucial few seconds where you can land an instant killing strike(appropriately called a deathblow). Bosses come with multiple health bars and require multiple deathblows, so it’s really not wise to just sit there taking little chunks out of their health when they can kill you in a few hits. But if you die, it’s not the end: Wolf has the ability to revive himself once after he is killed. Die when a boss is on its last legs? Resurrect and take those last few hits, or run away to regroup and heal up. But be careful: if you die again, that’s it. The death penalty here is brutal: you lose half of all your currency and current experience, and once it’s gone, it’s gone. Sometimes you will be spared this loss by a random chance of “Unseen Aid,” but that probability decreases the more you die or resurrect, as a disease called Dragon Rot spreads throughout the world. I don’t want to spoil the true nature of Dragon Rot, but it makes the death penalty in Sekiro feel very real. The more Wolf dies, the more NPCs catch the Dragon Rot, and it doesn’t just reduce your chance of Unseen Aid, it can affect the progression of side quests, too. Death isn’t the end in Sekiro: you can resurrect yourself to avoid losing progress. The key to understanding Sekiro’s combat is to achieve an equilibrium of aggression and defense. There are times when you should retreat, as there are some enemy attacks you can’t block or parry. Luckily, the game warns you about these so-called “perilous attacks” by flashing a red kanji character on the screen with a dramatic sound effect. There’s no doubt that this is a very punishing game, but the difficulty here is fair. Enemy attacks are choreographed well in advance, the game’s parry timing is generous, and you can use consumable items to buff your attack, defense, and posture. The variety of enemies here is reduced from Bloodborne, and most of them are human, which is definitely a contrast from that game’s mass of writhing alien terrors. The more realistic characters make sense in the context of the game’s combat, but the lack of variety is still a bit disappointing and you’ll notice that some enemies and even bosses are recycled in multiple areas with only minor differences. While Sekiro pushes its stealth mechanics to the forefront, and they can indeed be extremely helpful in areas populated by swarms of enemies, the stealth too-often boils down to crouching in tall grass to wait for enemies to turn their back. 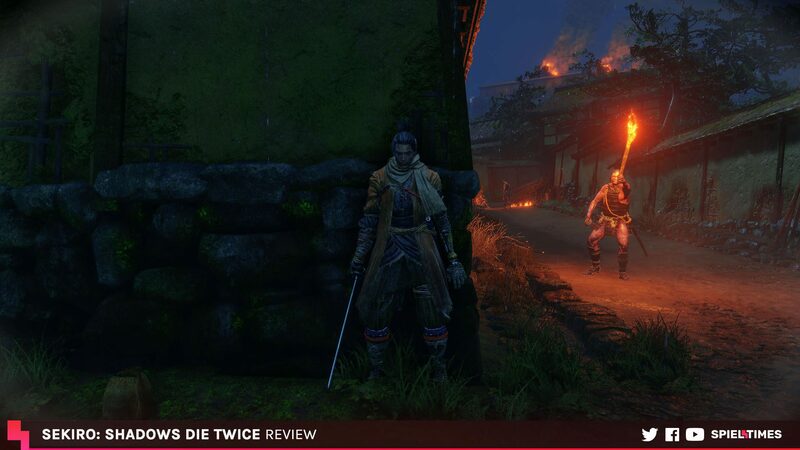 It’s a bit too simplistic for my taste, and stealth lacks the depth of the Tenchu series Sekiro was inspired by. Aside from the humorous idea of a shinobi pausing mid-battle to chow down on a piece of candy that miraculously increases his strength, your combat options are expanded here by the use of your prosthetic arm. 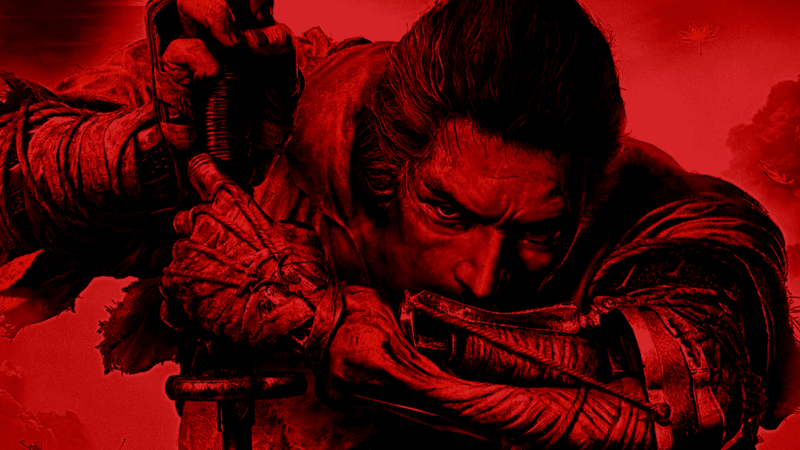 Since Wolf’s katana is the only main weapon in Sekiro, the variety in weapons comes here from attachments that fit onto the Shinobi Prosthetic, a tool fashioned by the mysterious Sculptor after Wolf loses his arm in battle. Prosthetic options vary from shuriken that can interrupt your enemy, axes that can break their posture or split their wooden shields apart, or flamethrowers that can set sensitive enemies ablaze. I won’t spoil the variety of prosthetics in Sekiro, but having found and experienced every one, I was delighted by the more dynamic possibilities they brought to combat. But don’t get me wrong: this is very much a “my way or the highway” experience. You have to learn these mechanics and you have to learn them in the way FromSoft wants you to. There are no shortcuts. There are no overpowered builds with new weapons and new play-styles that can destroy any boss. If that’s what you’re looking for, expect to be disappointed. But if you’re willing to learn the rules of engagement, it’s hugely rewarding. I should also mention Sekiro’s genius world-building. This is a masterclass in game design. It takes place in a sprawling, seamless world with branching paths, although the design here isn’t open-world in the strictest sense: it’s more Hollow Knight than GTA. Veterans of the Souls franchise will feel right at home here, but this time there are more generous checkpoints to compensate for the more punishing combat. As you progress and gain new abilities and items, intersecting paths in the world open up and show you new sides of areas you’ve already explored. Wolf’s grappling hook gives a great sense of verticality not found in the Souls franchise and it feels great. You’ll find yourself dashing to the roofs and hills to escape a mob of furious enemies and finding hidden passages and rooms through holes in the ceiling and crawlspaces where chests await with crucial upgrades. The world is gorgeous, with more light and color than From’s recent titles. Streaks of pink apple blossoms hover over ornate pagodas. Massive Buddha statues lean against sheer cliff faces and deep lakes. 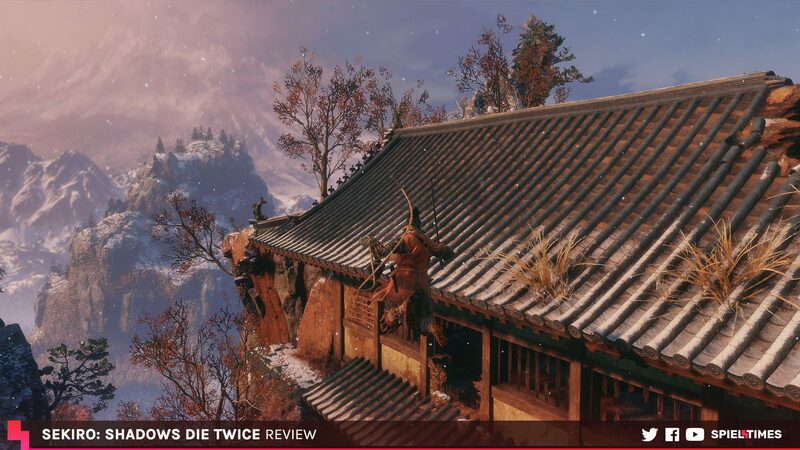 The locations of Sekiro are breathtaking. I can’t overemphasize how much I loved exploring this immaculately designed world. 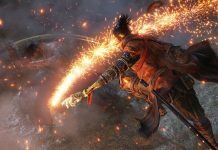 A quick word on replayability: it’s worth pointing out that Sekiro lacks the online cooperative multiplayer that many of From’s previous entries had. Indeed, there is no player-versus-player mode either, with none of the invasions that gave Dark Souls such a strong lasting online player-base. 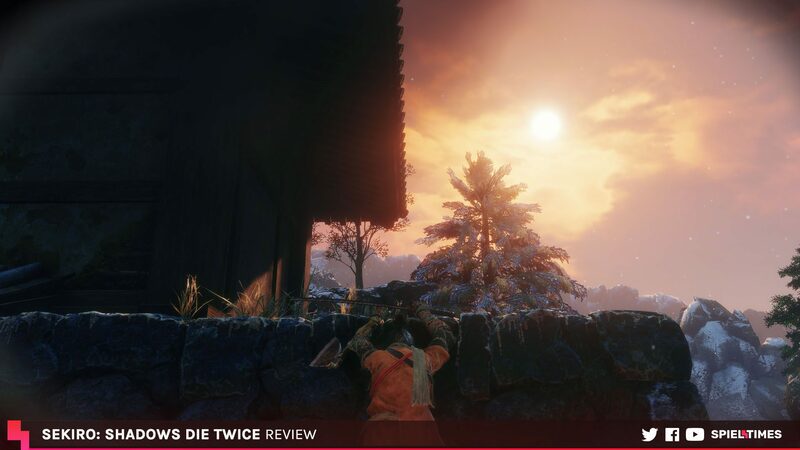 But there are still reasons to play Sekiro multiple times, including a challenging New Game+ mode, and the possibility of multiple endings with unique boss fights in different endings. Sekiro takes place in the Sengoku era, where warlords led rival clans vying for control of feudal Japan. At first, Sekiro seems much more grounded in the real world than their previous titles. Wolf is tasked by his adoptive father and master shinobi Owl with protecting his newly-appointed master, Lord Kuro, the so-called Divine Heir of the Dragon Heritage. The Dragon Heritage is a blessing(or perhaps a curse) that gives its carriers immortality through the gift of resurrection. But the greedy Ashina clan would rather monopolize the power of resurrection as a weapon of war. When one of the Ashina clan’s leaders captures Kuro and severs Wolf’s hand in the process, he embarks on a journey to rescue his master. The Ashina clan around which so much of Sekiro’s story revolves was very real, although one-armed shinobi probably didn’t have grappling hooks and prosthetic flamethrowers. But the grounding, in reality, fades when Sekiro takes a sharp turn for the supernatural and mystical. The game is fully voice acted and the script and performances are all sharp and engaging if a bit predictable at times. 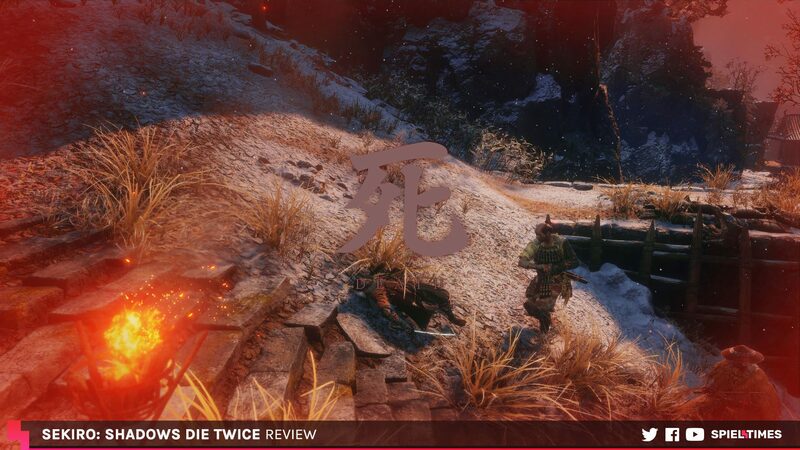 Sekiro is greatly aided by its stunning visual presentation. While it may not showcase the most technically advanced rendering techniques, it makes up for this with phenomenal art direction and animation. The flaming pagodas of the Hirata Estate sparkle with gorgeous lighting. The physics engine provides much of the attention to detail in interiors. Books and weapon-stands tumble to the ground and get pushed around by characters. Particle effects burst in spectacular fashion as sparks fly from the Shinobi Prosthetic. And light shafts shine through tree branches to great effect. Areas are often filled with light and color in sharp contrast with From’s recent back catalogue. Performance on PC, where I played, was excellent. Even with midrange hardware, it shouldn’t be challenging to get a mostly buttery-smooth and responsive 60 fps, although I did experience a strange stuttering issue where the game would occasionally freeze up for a moment. I can’t speak to console performance, but reports of 30 fps with uneven frame pacing on base consoles and unstable uncapped frame rates on their upgraded counterparts don’t inspire confidence. PC is certainly the way to play Sekiro if you have access to it. Sound design here is good, although not without issues. The music here is more prominent than in previous Souls games, with battle themes present for nearly every fight. Sweeping strings and woodwinds mix with traditional Japanese instruments like the Shakuhachi to great effect. But the music and effects work here can be a bit overpowering: the clanging sound effect every time you execute a stealth kill or deathblow can become tiring, music is mixed a bit too high, and weapon effects are a bit too tinny. But these are fairly minor complaints: FromSoftware know what they’re doing with high-quality sound design, and it shows. Sekiro is an exercise in patience, punishment, and triumph. It’s a masterclass in game design, with brilliant navigation baked into its deceptively complex world. The combat is brutal and unflinching. It seems simple to learn, but the depth and difficulty of Sekiro unravel as it stretches along its forty to fifty-hour long campaign. While I’ve always respected their work, some of their previous titles left me cold with their claustrophobic and anxiety-inducing atmosphere. While some of that still remains in Sekiro, it’s not the whole story. It is simultaneously more challenging and more inviting. And I can’t wait to get back to play it again, to experience more of this world, to see what endings I missed out on and to discover more secret bosses. Nothing’s perfect, but Sekiro is close.